Our first sucessful batch of popcorn! Way back when we were still at Cracker Boy Boat Works in Rivera Beach Florida we had an inverter installed on the boat so we could run our electrical corded devices off of our 12 volt battery system. It was the cheapest pure sine wave inverter I could find at West Marine. We intended for it to recharge the laptop battery and the double A batteries used in the camera and flashlights and to power the blender, food processor and the air popcorn popper. It has worked very well for all these purposes, except the popcorn popper. We really like popcorn. So, it was a real blow when we realized that this was going to be a popcornless journey. When I was provisioning for the trip, I didnâ€™t think too much about snacks except for popcorn. I was more focused on staples â€“ beans, rice, canned tomatoes, spices. At the last minute we picked up some two for one boxes of Triskets and Wheat Thins, some stick pretzels, and pita chips. But, all of this disappeared in short order. Greg loves crunchy food. We thought perhaps we could pop some corn the old fashion way with oil on the stove. We tried to do this in a regular pot and the pressure cooker with a lid sitting loosely on top. The popcorn turned out half popped and burned to the bottom of the pans. We coated the skillet with oil, let it heat up, poured in the corn and put the lid on. We listened with anticipation, then, heard the reassuring sound of popping. The first batch was ok, too many old maids. We tried it again, letting the skillet heat up more and adding less corn. It was perfect. 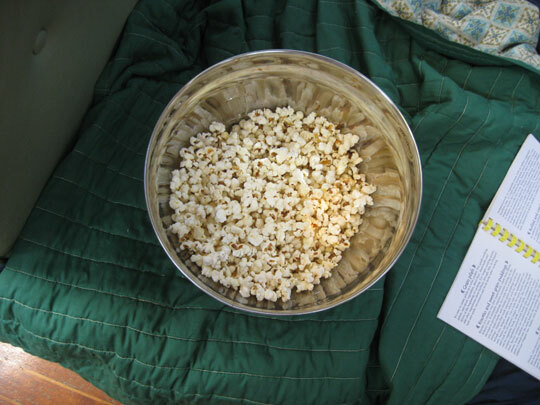 As we marveled at our bowl popped corn, Greg said, â€œI feel like we just discovered a continent.â€ Some days the rewards of our journey are as simple, like a freshly popped bowl of popcorn. Greg carefully cut away the mold and slathered peanut butter on our last piece of Ezekiel bread. We were now a day’s journey from another loaf. It was time to start making bread from scratch. Combine the yeast, sweetener and water. Stir and let set until the mixture becomes foamy. Create a well in the flour and slowly pour the yeast water into it and stir until the dough forms into a ball. With your hands, knead the dough for another minute. Turn the dough onto a lightly floured surface and knead until the dough is springy and elastic, about 5 minutes. The dough should be firm and slightly sticky. Cover, stow in a warm dry place and let rise until double in bulk, about an hour. Divide the dough into 6 balls and on a floured surface roll the dough (we use a tall smooth metal water bottle for this) into a circle about 1/8 to Â¼ inch thick. 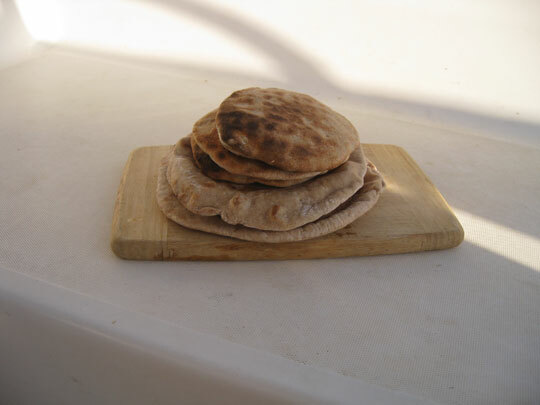 Place the bread over a medium-hot fire on the grill and cover the grill. Grill until the bottom is browned, about 5 minutes. Flip the bread and grill the other side until browned. This entry was posted in The Bahamas, The Galley. Bookmark the permalink. Yes, learning about navigation and seamanship comes first and food on board and on shore comes second! Keep it up. I find keeping us happily and healthily fed is real important. We are learning lots about everything as we go. We have only eaten off the boat twice now. Food in restaurants in Abaco is way expensive and I can make much healthier, satisfying meals on board. The foods I have to work with are limited and it is hard to keep fresh food for any length of time, so it is a little bit of a challenge. Cool! Solar corn? Are you telling me you set the pot in the sun and did it? Or did you just use a cast iron pot on the stove? Maybe you should get a back-packing oven like Lisa Soenen has. It is tricky though- easy to burn on the bottom. I couldn’t live without popcorn either. I don’t have a solar over, yet. Just the cook book. We made the popcorn on the stove in the skillet. I will look into the backpacking oven – that sounds like a good idea, although I want to learn how to cook using as little fuel as possible.